Abbott was born in Flint, Michigan. He was picked up by the Ypsilanti, Michigan, American Legion team and went on to win the championship. He graduated from Flint Central High School in Michigan where he was a stand-out pitcher and quarterback. He played for the Grossi Baseball Club during the summer in the Connie Mack leagues of Michigan. He was drafted in the 36th round by the Toronto Blue Jays in the 1985 Major League Baseball draft but did not sign, instead moving on to the University of Michigan. In 1991, Abbott went 18-11 for the Angels, who finished in last place in the American League West with an 81-81 record. Abbott posted the fourth lowest Earned Run Average in the American League (2.89) while pitching 243 innings. As a result, Abbott finished third in the American League Cy Young Award voting. In the 1992 season, he posted a 2.77 ERA (fifth lowest in the American League) but his win-loss record fell to 7-15 for the sixth-place Angels. Abbott also won the Tony Conigliaro Award in 1992. 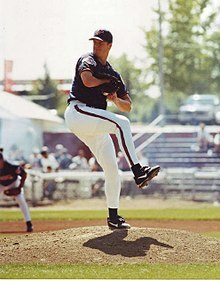 Abbott returned to the White Sox in 1998, starting five games and winning all five. Abbott continued his comeback the following year with the Milwaukee Brewers, but pitched ineffectively. This was the first time he had played for a National League team, forcing him to bat for the first time in his career. He recorded two hits in 21 at-bats during his Brewers stint. When preparing to pitch the ball, Abbott would rest his mitt on the end of his right forearm. After releasing the ball, he would quickly slip his hand into the mitt, usually in time to field any balls that a two-handed pitcher would be able to field. Then he would secure the mitt between his right forearm and torso, slip his hand out of the mitt, and remove the ball from the mitt, usually in time to throw out the runner at first or sometimes even start a double play. At all levels, teams tried to exploit his fielding disadvantage by repeatedly bunting to him. ^ a b Jim Abbott Hickoksports Biography Archived March 15, 2005, at the Wayback Machine Hickoksports Retrieved on 2006-07-28. ^ "Official Jim Abbott on Facebook". Retrieved June 8, 2014. ^ "Jim Abbott book signing and public events". Retrieved June 8, 2014. ^ a b c d e f g h i Berg, Chuck (2002) . Dawson, Dawn P (ed.). Great Athletes. 1 (Revised ed.). Salem Press. pp. 4–6. ISBN 1-58765-008-8. ^ Kepner, Tyler (June 6, 2007). "Talkin' Baseball With the Yankees". New York Times Bats blog. ^ WRAL. "Coach Yow Receives Courage Award From U.S. Sports Academy :: WRALSportsFan.com". wralsportsfan.com. Retrieved September 18, 2017. ^ "Cooper Receives Viscardi Award". University of Pittsburgh. 2014. ^ Erskine, Chris (April 1, 2012). "Book review: 'An Improbable Life' by Jim Abbott and Tim Brown". The Los Angeles Times. Retrieved September 4, 2013.